As the Northwest Ohio area’s only academic medical center, the University of Toledo Medical Center (UTMC) delivers high-level physician education, while managing a 233-bed hospital for patients as well as 34 specialty clinics. This broad, complex level of responsibility needs a comprehensive, robust interoperability system to connect its different EHR systems so residents, physicians, and technicians can access data whenever, wherever they are. 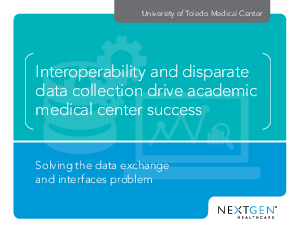 With more than a half-dozen disparate systems, UTMC needs a reliable, robust system to tie everyone together so providers have critical access to patient data from the classroom to the operating theatre. Read this case study to learn how the Mirth® solution has delivered to all of these requirements and enabled University of Toledo.